Deze ultieme carnauba geeft uw lak langdurige bescherming en glans. 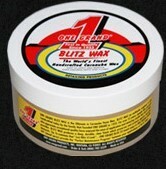 "Blitz Wax" an authentic original, is the ultimate in Carnauba Paste Wax. Each jar is carefully handcrafted today the same traditional way it has been for over 55 years, and by the same family that founded ONE GRAND in Hollywood in 1933. "Blitz Wax" is trusted and famously known around the world for its' exceptional quality, ease of application, and amazing results. "Blitz Wax" produces a deep, durable, clear finish, which preserves and protects against harmful elements for extended periods of time. "Blitz Wax may be layered in coats as many times as desired adding rich depth & gloss. "Blitz Wax" is compatible with our (Brand New) "Factory Finish Cream Wax"(the cream version of Blitz - recommended as a quick alternative to Blitz when time is very precious). Either product may be layered in any sequence and is safe on all automotive paint finishes. Remember, with "Blitz Wax", a little goes a long way, which makes it very environmentally friendly. From your daily driver, to the most exotic & rare show cars, "Blitz Wax" delivers stunning results, which stand the test of time. Between applications of "Blitz Wax", we recommend using ONE GRAND "BLUE 33" (wash soap) and ONE GRAND "Show Off" (detail spray) - The "Perfect Maintenance Program" - for that "Just Blitz Waxed" Look, all the time.